The Rabbit Rabbit relationship is one that could work…or it just could not. Being the same zodiac sign, these rabbits have many similarities; their outlook on life is essentially the same. Yet, on the other hand, too many similarities can also breed boredom and conflict within the partnership. The success of this Rabbit Rabbit friendship will depend on the rest of their charts. This Rabbit Rabbit couple in love will spend the majority of their relationship in the clouds. As rabbits, they are both idealists, preferring to dream rather than be grounded in reality. This can make the dating between two rabbits quite the whimsical affair. But one day those dreams will have to live up to reality – otherwise there will be stormy seas up ahead for these two love birds. The Chinese rabbit animal sign will dream of themselves in far away places, meeting exotic people, returning to their perfect homes to hold each other tight through the long winter. Their home life will be lively, filled with many friends and much entertainment. Beautiful and detailed, this home will host close companions of the two rabbits, always with their special flare for the creative. And all this will be quite possible, so long as one will to step up in the Rabbit Rabbit marriage relationship to make this happen. True to their personalities, both will try to take the least amount of responsibility in the relationship, possibly to the point where both take none at all. Then where will they be? Nor is this zodiac sign the best with finances. If they are happy with being poor and dreaming, this couple will work just fine, otherwise one must take the lead in the relationship to make their daydreams come to fruition. Despite all of this, both rabbits will share good love compatibility for each other. They will ensure to make this relationship their own perfect idea of love, filled with details, surprises and much affection. And as in their nature, they will expect perfection from their partner. If it isn’t found, as with any rabbit relationship, they might start to stray which will result in a break up of the Rabbit Rabbit love match. Each has the tendency to be nit-picky with the other and in true rabbit fashion, the other will probably never let on that slight imperfection that is eating at them about their partner. These two will especially need support from friends and family if they want to keep the spark alive, as they both are predisposed to worry–about the Rabbit Rabbit marriage compatibility of all things. Even in bed the Rabbit Rabbit couple will find it difficult to sexually satisfy each other other. Yet when trouble hits, both the Rabbit male and Rabbit female must commit to addressing the issue at hand or the problems will only serve to pull the two apart. The catch is that no rabbit wants to bring any conflict to light, least of all in a highly charged romantic relationship. That being said they must proceed with caution in matters such as these. Initially, the Rabbit Rabbit soulmates will be drawn to each other due to their identical approach to life. They will admire the other’s outlook and persona; they will have much in common and similar social interests. Yet, if these two rabbits want to make this relationship work in the long run, they must commit to communication. Otherwise, all the hopes and dreams they so eagerly applied in the early stages of their relationship will quickly diminish and both the Rabbit man and Rabbit woman will start to wander in search of their perfect mate. 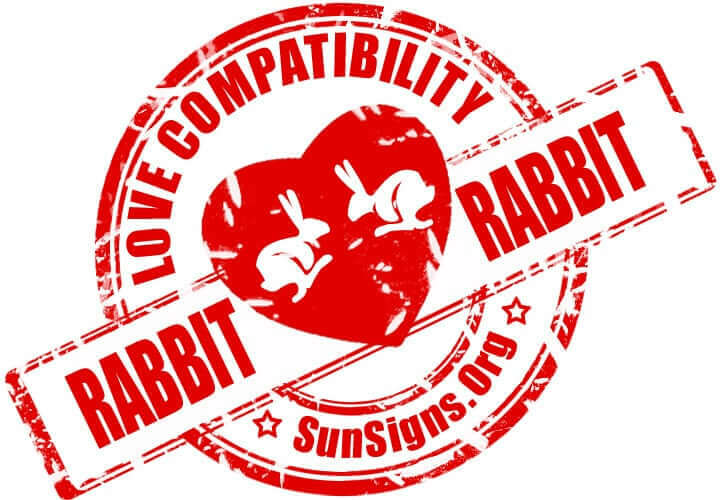 Rabbit & Rabbit Chinese Horoscope Compatibility Rated 3 Hearts!